Cloth dolls move easily and they are soft. They can be hugged. They are a lot like people, even if they are caricatures. When I was smaller my mother used to read Raggedy Ann stories to me. The most fascinating part was that, when the people were away, the dolls would stop being still and 'come to life' . They would have lives of their own; doing things and having adventures. In my mind, this became a sort of template for what dolls do when people aren't around. 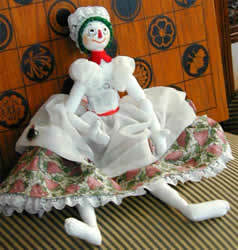 As time went on I made cloth dolls, mostly for younger relatives. Then, I was making the kind of pretty, cute dolls popular at the time. I found patterns for them in magazines like McCall's Needlework & Crafts. My approach to doll making has changed over time. I still make a fair number of Raggedy Anns but now but I also make the occasional politically-incorrect but dearly-beloved Golliwogs, as well as designs from contemporary doll artists. Raggedy Ann is an important culture icon. She represents an innocent time when dreams were real. Such dreams tell us things about ourselves, about our childhood and about our world. They are a kind of shorthand for larger ideas. Raggedy Ann has readily identifiable characteristics: red hair, usually curly, black shoe button eyes, a red-triangle nose and a smiling mouth with a little red center. She wears bloomers with a calico dress and a white apron. The heart embroidered on her chest refers back to the original Raggedy's candy heart..
Later on, it became important to me to make dolls that were different. Dolls made from my own patterns or from the other original doll-makers selling patterns that were not in the common mold. These dolls were different.They had character, and were not for children. Some call them 'art dolls' but that seems a bit fanciful to me. I guess they are dolls for adults. I don't think an artist chooses an art form or a musician chooses his instrument. The art form or instrument chooses the artist or musician, and dolls chose me. Friends have asked me "Why dolls? You're talented. You could do anything", meaning I could do something more acceptable or commercial. The implication is I was wasting my time on cloth dolls. It's not a waste. My small universe, my apartment, has every surface covered by cloth dolls. There are dolls of various kinds, various shapes, long-haired, short-haired, smiling, frowning, wide-eyed, sleepy-eyed. They all have personalities. Each in its own way makes a statement. Dolls develop as you craft them. You start out with one concept and it morphs into another one. I don't know why I make cloth dolls. I do know that I have to. When I get an idea for a cloth doll a whole little world opens up and the creature I'm making starts to talk to me, to tell me what kind of hair she wants, and what colour clothing in what design and how her face should be. The act of creation becomes a two-way street.